Hundreds of people look towards the gods for help. This generally takes the form of a simple prayer in the case of most commoners, but some have the favour of the gods. The gods not only answer these people’s prayers, but they can tap into the deific power granting themselves spells. They are wise and generally enter leadership roles. But the clerics are varied in kind, each god’s followers acting different and filling alternate niches. Role: Which role a Cleric fills is dependent on which deity he worships. One which worships a healing deity might be strengthening and restoring his allies, a priest devoted to the smithing god might enhance his fellows weaponry, a cultist with a lord of destruction as his patron may fight with his companions as a front-line fighter. The Cleric’s class skills (and the key ability for each skill) are Concentration (Con), Craft (Int), Decipher Script (Int), Diplomacy (Cha), Heal (Wis), Knowledge (arcana) (Int), Knowledge (history) (Int), Knowledge (nobility) (Int), Knowledge (religion) (Int), Knowledge (the planes) (Int), Listen (Wis), Profession (Wis), Sense Motive (Wisdom), Spellcraft (Int). Weapon and Armour Proficiencies: Clerics are proficient with all simple weapons, with light armour, and with shields (except tower shields). In addition the Cleric is also proficient with his deity’s favoured weapon, regardless of it being a simple, martial, or exotic weapon. If the weapon is an unarmed attack, the Cleric gains Improved Unarmed Strike as a bonus feat. Aligned Caster: A cleric can't prepare a spell with an alignment descriptor unless he possess that Alignment. Aura (Ex): A cleric of a chaotic, evil, good, or lawful deity has a particularly powerful aura corresponding to the deity’s alignment (see the detect evil spell for details). Domains: A cleric’s deity influences his what magic he can perform, his gifts, and how he can channel energy. A cleric chooses two domains from among those belonging to his deity and any other domain which isn't on your patron's forbidden list. A cleric can only select an alignment domain (Chaos, Evil, Good, or Law) if his alignment matches that domain. Spells: A cleric casts divine spells, which are drawn from the cleric spell list and his domains. A cleric must choose and prepare his spells in advance, unlike a sorcerer. Like other spellcasters, a cleric can cast only a certain number of spells of each spell level per day. His base daily spell allotment is given on Table: The Cleric. In addition, he receives bonus spells per day if he has a high Wisdom score. When preparing a non-orison spell from his Cleric Spell List instead of Domain Spell Lists it takes three slots of that level or a spell slot of higher level. Clerics meditate or pray for their spells. Each cleric must choose a time at which he must spend 1 hour each day in quiet contemplation or supplication to regain his daily allotment of spells. Time spent resting has no effect on whether a cleric can prepare spells. A cleric may prepare and cast any spell from his domains, provided that he can cast spells of that level, but he must choose which spells to prepare during his daily meditation. Turn or Rebuke (Su): All clerics of have the power to affect creatures by channelling the power of his faith through his holy symbol (see Turn or Rebuke Undead). A cleric can turn, rebuke, command, or destroy creatures. Which creatures are able to be manipulated by each of these is determined by the cleric’s domains. A cleric may attempt to use this ability a number of times per day equal to 3 + his Wisdom modifier. A cleric with 5 or more ranks in a Knowledge skill gets a +2 insight bonus on turning checks against creatures which can be identified with that skill. Master of Scripture (Sp): Upon attaining 2nd level, a Cleric can cast Amanuensis and Read Magic as a Spell-Like Ability 1/day. The caster level for this ability is equal to your cleric level. In addition he gains Scribe Scroll as a bonus feat. Patron’s Vessel (Su): At the cost of 25 gp a 4th level Cleric can spend a standard action to infuse water with a divine presence. This requires adding a small amount of materials to be added to the water, which materials can be used are determined by Cleric's domains. The material to be affected must be a singular a liquid which takes the same amount of volume as a normal flask of water. Regardless of the material, this functions as either Holy Water or Unholy Water (choosen at the time of creation). Minor Domain Gift: At 5th level, a Cleric gains access to the Minor Gift of one Domain of his choice. Patron’s Vengeance (Ex): As you grow in power, your patron grants you skill with his favoured weapon. At 7th level, you gain Weapon Focus (Deities Favoured Weapon) as a bonus feat. Genius (Su): Tiny remnants of divine energy are trapped in your body, granting you a divine spark. Upon reaching 8th level, a Cleric may cast level zero cleric spells without having to prepare them. Spells cast in this way do not expend spell slots. At 16th level, the Cleric may cast level one cleric spells without having to prepare them. Spells cast in this way do not expend spell slots. Domain Gift: At 10th level a Cleric gains access to the Domain Gift of the Domain you selected for Minor Domain Gift. In addition he gains the Minor Domain Gifts of each of his domains. Shield of Faith (Su): Upon attaining 10th level, a Cleric gains a +4 sacred bonus on saves against death spells, magical death effects, energy drain, and negative levels. In addition to the cleric gaining this protection, all adjacent allies gain the effects as well. At 13th level, the benefits of this ability are granted to all allies within 30 feet. Crusaders Blade (Sp): A Cleric of 11th level can undergo an hour long ritual which converts a weapon into a force of spirituality. After completing this ritual the weapon deals divine damage rather than bludgeon, piercing, or slashing (Other forms of damage remain unchanged). This can only work on the favoured weapon of your patron. The effects of this ritual stop, if it hasn’t been in contact with a cleric who enacted the ritual for 1 day. Paragon Symbol (Su): Upon attaining 13th level, any Holy Symbol in a Cleric’s Possession gains additional Hit Points and Hardness equal to double the Cleric’s class level. In addition, as long as he is in contact with a Holy Symbol of his patron deity, he can use the Patron's Vessel ability at no cost. Children of the Gods (Sp): At 14th level, a Cleric can call creatures from his master’s domain to serve him. This functions as the Lesser Planar Ally Spell. This ability has a caster level equal to cleric level and can be used once per month. Despite being a Spell-Like Ability, this ability has an Experience Point Cost of 500. Major Domain Gift: At 10th level a Cleric gains access to the Major Gift of the Domain you selected for Minor Domain Gift. In addition he gains the Domain Gift of each of his domains. Raise Dead (Sp): At 16th level, a Cleric can call the dead back from the afterlife. This functions as the Raise Dead Spell. This ability has a caster level equal to cleric level and can be used once per month. Despite being a Spell-Like Ability, this ability has a Material Component of Diamonds worth a total of least 6,000 gp. Tongue of the Sun and Moon (Ex): A Cleric of 17th level or higher can speak with and understand any creature, regardless of if it would normally possess a language. Counts as an Outsider, instead of the Cleric’s normal type if it would be beneficial. Immunity to Mind-Affect Effects and Petrification. +5 Bonus on saves against Poison. Acid, Cold, Electricity, and Fire Resistance 10. Last edited by Milo v3; 2013-01-20 at 07:01 AM. Turn & Destroy: Creatures with the Earth Subtype. Bolster, Rebuke, & Command Creatures with the Air Subtype. Minor Domain Gift: This Gift grants a +1 bonus to caster level, when casting a spell with the Air Descriptor. Domain Gift: This Gift grants a Fly speed of 40 ft, Good Manoverability. How this fly speed physically manifests is up to the cleric. Regardless of its appearance, this is a supernatural ability. Major Domain Gift: This Gift grants an immunity to electricity damage. Bolster, Rebuke, & Command Creatures with the Animal Type. Minor Domain Gift: This Gift grants a +3 sacred bonus to Animal Handling, and Riding checks. Also adds Animal Handling and Ride to the Cleric's list of Class Skills. Domain Gift: This Gift allows the Cleric to be able to communicate with animals, as if they shared a language. Major Domain Gift: This Gift grants the Wildshape Ability, counting as a druid of his Cleric Level. This can only be used to take the forms of animals. Bolster, Rebuke, & Command Creatures with the Construct Type. Minor Domain Gift: This Gift grants a +5 sacred bonus to Craft checks. Domain Gift: Any armour, skill tool, or weapon crafted by a person with this Gift is masterwork in quality. This doesn't increase the price of the object for the purposes of determining Craft DC's. Major Domain Gift: This Gift means each day he can heal a total number of hit points of damage equal to his cleric level × his wisdom bonus. A cleric may choose to divide his healing among multiple recipients, and hedoesn’t have to use it all at once. Using this Major Domain Gift is a standard action. This ability only works with healing constructs and objects. Patron's Vessal: Splinters of Wood. Minor Domain Gift: This Gift grants a +1 sacred bonus to armour class if he was hit by an attack in the previous round. Domain Gift: This Gift grants a +1 sacred bonus to attack and damage rolls if he missed with an attack in the previous round. Major Domain Gift: This Gift grants a +3 sacred bonus to attack and damage rolls when attacking creatures without a neutral alignment on either axis. Turn & Destroy: Creatures with a Base Land speed of 10 ft. or lower. Bolster, Rebuke, & Command Creatures with a Base Land speed of 60 ft. or higher. Patron's Vessal: Droplets of Silver. Minor Domain Gift: This Gift grants Run as a bonus feat. Domain Gift: This Gift allows the Cleric to be able to change directions while running. Major Domain Gift: This Gift grants a +30 bonus to all movement modes. Turn & Destroy: Creatures with the Lawful Subtype. Bolster, Rebuke, & Command Creatures with the Chaotic Subtype. Minor Domain Gift: This Gift grants a +2 bonus on armour class against creatures with the Lawful Subtype. Domain Gift: This Gift grants a +2 bonus on attack and damage rolls against creatures with the Lawful Subtype. Major Domain Gift: This Gift grants 15 DR/Cold Iron. Minor Domain Gift: This Gift grants a +3 sacred bonus to bluff, and diplomacy checks. In addition bluff and Diplomacy are added to the Clerics class skills. Domain Gift: This Gift allows the character to boost his Charisma by 4 points a number of times per day equal to his Wisdom Bonus (Minimum 0). Activating this power is a free action. The Charisma increase lasts 1 minute. Major Domain Gift: This Gift causes non-hostile creatures to have an attitude one step closer to Helpful. Turn & Destroy: Creatures with the Fire Subtype. Bolster, Rebuke, & Command Creatures with the Cold Subtype. Minor Domain Gift: This Gift grants a +4 sacred bonus to fortitude saves against the effects of cold weather. Domain Gift: This Gift grants Cold Resistance 10. Major Domain Gift: This gift allows the Cleric to expend a use of Turn or Rebuke to lower the Temperature Band in 1 mile one closer to Unearthly Cold. This effect lasts for 1 hour. Minor Domain Gift: This Gift increases the Cleric's chance of becoming stable while dying to 20%. Domain Gift: This Gift grants a +1 bonus to Hitpoints per Cleric Level. Major Domain Gift: This gift allows the Cleric to expend a use of Turn or Rebuke to heal 4d8 +1/cleric level points of damage. Bolster, Rebuke, & Command Humanoid. Minor Domain Gift: This Gift grants a +2 sacred bonus to all Craft and Profession checks. Domain Gift: This Gift grants a +3 sacred bonus to leadership score. Major Domain Gift: This gift allows the Cleric to expend a use of Turn or Rebuke as an immediate action to take the damage a creature within 100 ft. would otherwise be dealt. The damage dealt to the cleric cannot be reduced by resistance, damage reduction, or immunities. Bolster, Rebuke, & Command Lions. Patron's Vessal: Shards of Steel. Minor Domain Gift: This Gift grants a +4 sacred bonus on saves to resist fear. Domain Gift: This Gift grants immunity to Fear effect. Major Domain Gift: This Gift grants a +2 morale bonus on attack rolls. Turn & Destroy: Creatures with a spell of the Light descriptor as a Spell-Like Ability. Bolster, Rebuke, & Command Creatures with a spell of the Darkness descriptor as a Spell-Like Ability. Patron's Vessal: Shards of Glass. Minor Domain Gift: This Gift grants Darkvision 120 ft.
Domain Gift: This Gift allows the Cleric to be able to see in any form of darkness (even magical). Major Domain Gift: This Gift grants the Cleric a +30 bonus to his speed as long as he remains within shadowy illumination or darker. Bolster, Rebuke, & Command Undead. Minor Domain Gift: This Gift grants a +1 bonus to caster level for necromancy spells. Domain Gift: This Gift grants Tomb Tainted Soul as a bonus feat. Major Domain Gift: This Gift allows a death touch once per day. Your death touch is a supernatural ability that produces a death effect. You must succeed on a melee touch attack against a living creature (using the rules for touch spells). When you touch, roll 1d8 per cleric level you possess. If the total at least equals the creature’s current hit points, it dies (no save). Bolster, Rebuke, & Command Creatures with the Demon subtype. Patron's Vessal: Shreds of Steel. Minor Domain Gift: This Gift grants a +4 sacred bonus to sunder objects. Domain Gift: This Gift allows the attacks of the cleric to bypass Hardness. Major Domain Gift: This Gift allows the Cleric to cast Shatter at-will, as a level 1 spell. Bolster, Rebuke, & Command Dragons. Minor Domain Gift: This Gift grants a +2 sacred bonus on saves against paralysis and sleep effects. Domain Gift: This Gift grants a +2 sacred bonus to natural armor. Major Domain Gift: This Gift grants the cleric a Breath Weapon. This breath weapon is 60 ft. line, which deals 6d10 fire damage. This damage is halved on a successful save, the DC is 10 + 1/2 Cleric level + Cha modifier. Turn & Destroy: Creatures with the Elf Subtype. Bolster, Rebuke, & Command Athach. Minor Domain Gift: This Gift grants a +1 sacred bonus to armour class. Domain Gift: This Gift grants a +2 sacred bonus to attack rolls against creatures with the Elf Subtype. Major Domain Gift: This Gift grants a burrow speed of 60 ft.
Last edited by Milo v3; 2012-12-05 at 05:43 AM. The Class is up, and I've started to add in Domains. Feel free to PEACH even if all the Domains aren't up yet. Weapon and Armour Proficiencies: Clerics are proficient with all simple weapons, with all types of armour (light, medium, and heavy), and with shields (except tower shields). In addition the Cleric is also proficient with his deity’s favoured weapon, regardless of it being a simple, martial, or exotic weapon. Eh. This is more personal opinion than anything else-why do even the Clerics of Boccob and Yondalla, the two with the least business doing anything with warfare, get plate mail? I'd personally move that they're proficient with light armor, but can cast in heavier without ASF. Put it as a power of the martial domains, perhaps. Weapon Proficiency in the diety's favored weapon, however, is never something to be ignored. Perhaps an added note that dieties who have fists as their favored weapon gain Improved Unarmed Strike. Ah, the meat of the issue here. You're expanding something which is already the Cleric's biggest strength-his Domains. They're not only more powerful than they were, but you're letting them take extra? How about you at least spread them out, rather than giving them all to him at 1st level? Make them choose between the major gifts of each domain, or the greater versatility the domains grant them? Heck, that could be quite a fix right there-grant them a single domain from their diety at first level, and then make them choose between the greater abilities granted from specializing in that, or taking the minor gifts and the added spell choices. A cleric may attempt to use this ability a number of times per day equal to 5 + his Wisdom modifier. A cleric with 5 or more ranks in a Knowledge skill gets a +2 insight bonus on turning checks against creatures which can be identified with that skill. Any particular reason for changing this from the prior 3+CHA modifier? 5 + Wisdom turns it from 'I can do this pretty often' to 'I can do this all day and not break a sweat. Divine Metamagic boosters, go!' I'd say that it's not broke-don't fix it. Well, actually, it's already a little broken. DMM proves that. Bestow Guidance (Sp): A Cleric’s duty is to spread the teachings of his lord, and through his power, guidance can be granted upon them. A Cleric of 2nd level or above can expend a standard action to grant a willing adjacent creature a +1 bonus to a single Attack Roll, Saving Throw or Skill check. Which roll this grants bonus to be chosen when the ability is used. The bonus lasts 1 hour or until expended. This can be used a number of times per day equal to 3 + your Wisdom Modifier. Master of Literacy (Ex): Clerics were the first mortals to be given the gifts of language and scripts, as such they have great skill in those regards. Upon reaching 2nd level, a Cleric can understand every written language and gains a +4 insight bonus to Decipher Script checks. I'd...have a lot more problem with this if it weren't for the fact that Comprehend Language is a 1st level spell, and this is only for -written- languages. Be sure to specify that it's not for the spoken word. Like I said, you have a lot of flavorful things here, and they make it hard to hate for having more abilities. Channel Divinity (Su): Clerics can not only manipulate divine energy to manipulate creature, they can also channel the divine energy to harm with a touch. At 3rd level, a Cleric can make a touch attack as a standard action, if this attack hits, the target is dealt 1d8 energy damage. Which type of energy damage it deals is chosen by the Cleric when being used, but only those which are allowed by his domain. A Cleric can channel divinity a number of times per day, equal to a third of his cleric level (Rounded Down) plus his wisdom modifier (Minimum 0). At 6th level and every three levels thereafter, the damage dealt by this ability is increased by 1d8. I really have to say you should change this in some way. The damage is pretty much laughable, even at the level you get it, even when it starts getting stronger regularly. There's also the fact that this is an ability that not every Cleric can get, if they don't choose the air/water/earth/fire domains. Why not just make this one of the minor abilities in those domains, rather than putting it here? Patron’s Vessel (Su): At the cost of 25 gp a 3rd level Cleric can spend a standard action to make a material infused with divine essence. The materials which can be used are determined by Clerics domains. Regardless of the material, this functions as Holy Water. If you have the death, evil, fiend, repose, renewal, or undeath domain, you can choose to create Unholy Water. Not really a problem here per-se, but why is Renewal one of the domains that lets you create Unholy Water? Master of Scripture (Sp): Upon attaining 4th level, a Cleric can cast Amanuensis and Read Magic as a Spell-Like Ability at-will. The caster level for this ability is equal to your cleric level. In addition he gains Scribe Scroll as a bonus feat. Eeeh...I'm still sketchy on letting him have spells at will, but these are 0th level. He is scripture-heavy though, no doubt about that. See 'Domains' for my thoughts on how to split this up. Divine Favour (Ex): When a Cleric of 6th level uses Bestow Guidance, the bonus granted is equal to the Cleric’s class level divided by 3. I keep thinking of the fluffier gods here whenever things like this pop up. Yondalla wouldn't want you hitting someone over the head as hard as you could. Olidimarra would frown on you knifing someone rather than tricking them. I have no good way to fix this, as you seem intent on adding a trick at every level, and Weapon Focus is far from a game-breaking feat...but it just seems wrong to include it even for the peaceful or trickster dieties. Atonement (Ex): At 9th level, a Cleric grant those who have fallen a chance at redemption. This functions as the Atonement Spell. This ability has a caster level equal to cleric level and can be used a number of times per day equal you his Wisdom Modifier. Situational spell only useful once in a blue moon? Check. A -little- suspicious that it's so many times per day...but if you're legitimately using it that many times a day, something's wrong with your populace. No problems with it, but again, it's not useful for EVERY Cleric. What about the Clerics of dark, evil, yucky gods? It's fluff, but I'm feeling like it's misplaced fluff. Replace Cure Minor Wounds with Stabilize, and we're golden on 0th level spells. 1st level spells are a bit more tricky...but at 16th level, you should already be so full of healing that you burst. I'm more worried about infinite Divine Favor and such, that have a duration of minutes. Perhaps just a hefty boost to 1st level spells, or just leaving them out altogether? Or just let them have a -selection- of spells to use at will. Like Bless and Protection from Good/Evil at will. Remember that they get spells-you don't need so much fluffy fluff. Heck, you could even add to the list of 'level 1 spells that don't expend slots' as moderate gifts for a lot of domains. 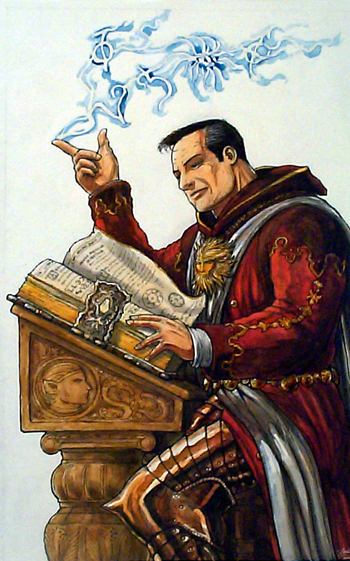 Deific Wisdom (Sp): At 9th level, a Cleric can cast Augury 1/day as a Spell Like Ability. This abilities caster level is 15. I like it. Kudos. But is there any reason why the CL is 15, rather than...well...the caster's level? Again, see Domains. This is where I feel he should be getting a third domain if he so chooses to forego domain gifts. Shield of Faith (Su): Upon attaining 10th level, a Cleric becomes immune to death spells, magical death effects, energy drain, and negative levels. In addition to the cleric gaining this protection, all adjacent allies gain the effects as well. Ahahahaha, no. No way. This is giving him a constant 4th level spell for free when he's still casting 5th? And...oh, wait. You want to give him the equivalent of Mass Death Ward. I say thee nay, villain! And again, not every God is going to want to give protection against death effects! Or it may be completely outside the purview of some! Generalize, not specialize! This would be far better suited as a moderate gift of Glory or Sun. Aura of Faith (Su): All allies within 30 feet of an 11th level Cleric gains the Benefit of his Minor Domain Gifts. At 20th level, all allies within 30 feet of the Cleric gains the benefits of his Minor Domain Gifts and his Domain Gifts. I'll reserve judgement on this one until I can see all the Domain Gifts, but this seems like too much. If you're going to boost up their Turn Undead so much, how about making this one of the uses? Grant all allies within 30 feet the benefits of your Minor/Major Domain gifts for a number of minutes equal to your Cleric level at the cost of 1-3 Turn Undead uses? Deific Insight (Sp): At 11th level, a Cleric can cast Commune 3/day as a Spell Like Ability. This abilities caster level is 15. See Augury. Also, 3/day? Please limit that a bit-Gods generally don't like to be called on so often. Crusaders Blade (Sp): A Cleric of 12th level can undergo an hour long ritual which converts a weapon into a force of spirituality. After completing this ritual the weapon deals divine damage rather than bludgeon, piercing, or slashing (Other forms of damage remain unchanged). This can only work on the favoured weapon of your patron. The effects of this ritual stop, if it hasn’t been in contact with a cleric who enacted the ritual for 1 day. Paragon Symbol (Su): Upon attaining 13th level, any Holy Symbol in a Cleric’s Possession gains additional Hit Points and Hardness equal to double the Cleric’s class level. In addition any non-magical material touched by the Symbol is affected by Patron’s Vessel if it is a suitable target. Again, I can't hate on this. The only thing I would say is...move it earlier. If you take half my advice, you're going to end up with...well, they're never dead levels for casters, but at least emptier levels. And Holy Water is hardly gamebreaking. Children of the Gods (Sp): At 14th level, a Cleric can call creatures from his master’s domain to serve him. This functions as the Lesser Planar Ally Spell. This ability has a caster level equal to cleric level and can be used once per day. At 17th level, this ability functions as Planar Ally. At 19th level, this ability functions as Greater Planar Ally. Not bad. This is nice and fluffy, and at these levels, Clerics can legitimately ask angels/devils for favors. But be sure to specify whether or not they still have to spend the XP costs. I would move for a removal of Greater Planar Ally, though. Let them have to legitimately call for the big guys. Servant’s Passasge (Sp): A Cleric of 14th level can create a portal to his patron’s realm. This functions as the Gate Spell except it can only be used for travel to his patrons homeplane. This ability has a caster level equal to cleric level and can be used once per day. Emphasis mine. Anyway...I don't see this being such a good idea. You're effectively giving them a 'get out of trouble free' card, or at least a major fallback plan that most can't counter. How about a Word of Recall that can be used 1/week instead, taking him to the nearest temple of his diety? Less reliable for a run away plan, and less...infringing on dieties than simply popping in on them whenever they want. You know my opinion by now. Raise Dead (Sp): At 16th level, a Cleric can call the dead back from the afterlife. This functions as the Raise Dead Spell. This ability has a caster level equal to cleric level and can be used once per week. At this level, I'm all for it. Just be sure to specify whether or not he has to spend the component cost. Miracle Bringer (Su): Upon reaching 18th level, a Cleric can make Miracles happen with but a whisper. This functions as the Miracle spell except it can be cast as an immediate action. This power can be used a number of times per month equal to your Wisdom Modifier. Resurrection (Sp): At 19th level, a Cleric can call the dead back from the afterlife even if there body was destroyed. This functions as the Resurrection Spell. This ability has a caster level equal to cleric level and can be used once per month. In addition to the above, the Cleric can take the appearance of his patron as a move action. All creatures with a line of sight to the Cleric that oppose his deity are Shaken for one day (No Save). The Cleric may remain in this form for a number of rounds per day equal to 5 * your Wisdom score. This can be ended as a free action. I have to point out a few problems here. Counts as an Outsider 'if it would be beneficial.' Do expand on that, otherwise you're going to run into that one guy that's suddenly immune to everything because 'it doesn't affect outsiders!' or 'It doesn't affect humanoids!' I'd also bump the SR, because that's quite pathetic for a form that's activated at will-if it's going to be a capstone, let -every- part of the capstone be impressive. At least to 32, which is the same he'd get from a level 20 Spell Resistance spell. Shaken is cool. Add that the Elemental resistances stack. Perhaps let him have some buffs to his stats while he's in his outsider form? As it is, something that can be held for a few minutes is...wait. Is that 5 * your wisdom -score- or your wisdom -modifier?- That's an important distinction, though everything I've said still holds. As it is, I feel this class is just too overwhelmingly tier 1, especially as he gains levels. Quadratic Wizards nothing, you made this guy -exponential.- Remove the specific stuff from a class that's supposed to be a generalist, adjust the fluff, and you'd have a solidly interesting Cleric to play. You didn't do a bad job, mind-you just seemed to get carried away with wanting to put every single bit of interesting idea you could into him. ...Woah. Okay, while a lot of this is really, really flavorful, I have to say that you've taken a Tier 1 class and tried to shoehorn him -really- hard into a Tier 1/2, which is really gonna hurt that Barbarian who's only a decent T3. I'm increasing the skill points for basically all classes as I do revisions. Also, with my Bard revision, his role as face is safe. But I'll lower it to 4+Int. This can affect more than just undead (or not even undead depending on your Domains), this means that it likely will have more oppertunity to be used more a day. But I have lowered it to 3+ Wisdom Modifier. It is specified. It specifies "written language". There's also the fact that this is an ability that not every Cleric can get, if they don't choose the air/water/earth/fire domains. Why not just make this one of the minor abilities in those domains, rather than putting it here? Or Animal, Celerity, Chaos, Cold, Darkness, Death, Destruction, Healing, Law, etc. Undeath can be a form of Renewal. In PF, they get level 0 spells at-will at first level. The reason for a "Trick at every level" is so that there aren't Dead Levels. Also, if you worship a peaceful deity who doesn't want you to go into combat, they shouldn't have a favoured weapon. Situational spell only useful once in a blue moon? Check. A -little- suspicious that it's so many times per day...but if you're legitimately using it that many times a day, something's wrong with your populace. Ever heard of confessionals in churches? They can have a large amount of people go into them a day. Also I wanted them to be able to cast whenever the need arises, but at-will would be to much. No problems with it, but again, it's not useful for EVERY Cleric. What about the Clerics of dark, evil, yucky gods? It's fluff, but I'm feeling like it's misplaced fluff. So if you break the tenants of your evil god, you are going to need that spell if your a cleric. Most Cleric's likely cannot cast Death Ward. They don't get the Major Domain Gifts, only the Minor Domain Gifts, and the Domain Gifts. That's what Angels are for. What are you talking about? It specifically says only Slashing, Bludgeon, and Piercing. Also it turns it into Divine damage, which isn't good or evil. It just is to the plane. Not to the deity himself. You realise Monks have this ability. I'd also bump the SR, because that's quite pathetic for a form that's activated at will-if it's going to be a capstone, let -every- part of the capstone be impressive. It is based of the mechanics for Gods. [QUOTE]Perhaps let him have some buffs to his stats while he's in his outsider form? As it is, something that can be held for a few minutes is...wait. The god form is more cosmetic than actually being the god. Also, Wisdom score is correct. As you have partially merged with your deity.